" In my many years of Podiatry practice I have treated over 50,000 patient. It is my experience and that of other practitioners that many aches and pains occur from poor posture of the foot and leg. I have written this to help you understand the cause of these common complaints and how to provide relief through orthotic treatment. " The human foot was originally "designed" to travel on soft , natural surfaces like earth and sand. Unfortunately , instead of soft earth , we now spend every day walking and standing on unnatural hard, flat surfaces like pavements and floors. These surfaces force our feet to roll over to gain ground contact and our arches to flatten. Rolling over of the foot - or 'Excess Pronation' is believed to affect over 50% of the population ! Interestingly, altough the foot rolls inwards, often the shoe will wear excessively on the outside edge of the heel. This is because the foot normally 'lands' on the outside edge first and consequently rolls over causing excess pronation as a compensatory motion. Just like the tyres on a car, poor alignment of the feet can cause wear the tear to other parts of the body. 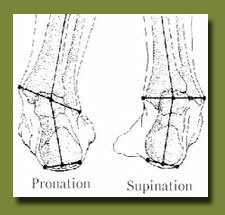 'Excess Pronation' often disrupts normal knee function and hip alignment and increases forces on the muscles in the lower back. Subsequently, 'Excess Pronation' can cause a wide range of common complaints. ﻿The answer is to treat the CAUSE of these complaint - not just the symptoms. 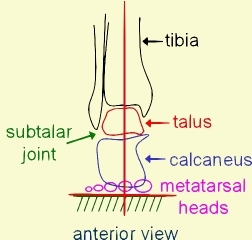 In other words, by restoring the lower limb's natural angle we can align the feet and body posture to their neutral position and take away the cause of these problems. VASYLI International manufactures a wide range of unique, patented orthotic footwear & footcare products. 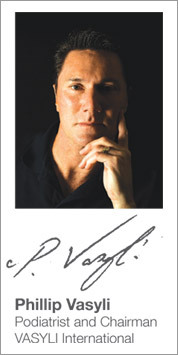 VASYLI products are invented by a Podiatrist and the result of many years of biomechanical research. 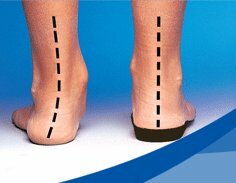 They are specifically designed to re-align the feet to their natural position and to improve body posture, relieving many chronic complaints in the process.